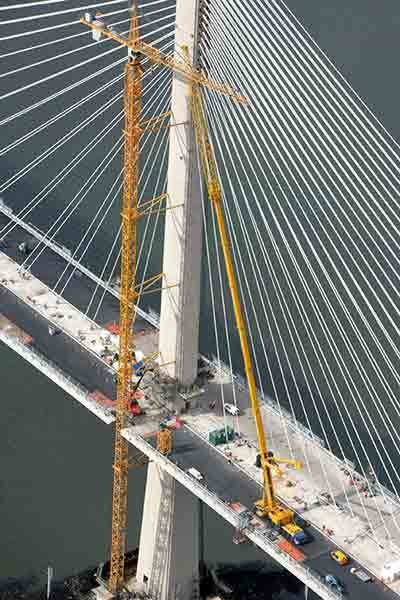 Ainscough Crane Hire also operated a total of twelve different types of Liebherr mobile telescopic and lattice boom cranes on the Queensferry Crossing construction site. These cranes ranged in size from 40 tonnes to 500 tonnes and were used to lift components needed to construct the bridge. At least one model of almost every telescopic crane that Liebherr manufactures was used on the project. More recently, a long-standing Liebherr customer, Edinburgh-based family business Bernard Hunter, won the contract from Forth Crossing Bridge Constructors (FCBC) to dismantle the three Liebherr 630 EC-H 40 tower cranes and the company purchased two new cranes from Liebherr to fulfil that contract. A 500 tonne LTM1500-8.1 mobile crane with a 35m fixed fly jib was used to remove the tower cranes’ tie bars from the bridge structure and was lifting five tonnes at a 57m radius and a 90 m hook height. This crane then went on to remove the tower cranes’ jib sections, head, cabin and slew assembly. Alongside the LTM 1500-8.1, a 300 tonne LTM 1300-6.1 mobile crane was used to remove the tower cranes’ counter jib, hoist unit frame and counterweight ballast blocks. This crane was lifting 22.2 tonnes at a 22m radius and a hook height of 55m.